TYPHOID. (Enteric fever- salmonellosis) also called (in India and Pakistan) tape- muhraqa. Barha bukhar, miadi bukhar. It is characterized by the Gradual onset of malaise, headache, vomiting and abdominal pain. Some time constipation and occasionally pea soup diarrhoea. • Rose spot, (small papule occur in the second week especially on the trunk and fade away on pressing) relative bradycardia, splenomegaly, coated or furred tongue ( in malaria it is uniform ally coated but in typhoid it is centrally coated and the margin is red) and abdominal distention and tenderness. • Slow (stepladder) rise of fever to maximum and then slow return to normal. • Relative Leucopenia, blood, stool, and urine culture positive for salmonella. The normal heart is 60 – 100/mint in adult and if it is less than 60/mint then is called bradycardia and if it is >100/mint then it is referred to as tachycardia. Normally with each degree increase in body temp- 15-20 beat /min heart rate increase but if temperature increases and the heart rate remain slow then it is called relative Bradycardia. • Bradycardia is strictly defined in adults as a pulse rate below 60 beats per minute (bpm). However, few individuals show no symptoms until heart rate falls below 50 beats per minutes. A resting bradycardia can be normal - for example, in trained athletes. Absolute bradycardia is defined as a heart rate below 40 bpm. Physiologically, heart rate can vary in normal adults from 40 bpm up to 180 bpm. However, a relative bradycardia may be greater than 60 bpm if that rate is too slow for the hemodynamic requirements of the patient. Children tend to have a higher resting pulse rate than adults and generally the smaller they are, the faster their heart rate will be. Hence, in a neonate, bradycardia may be defined as a rate below 100 bpm. 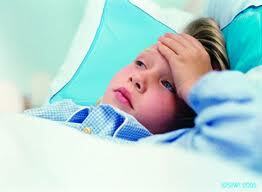 IN typhoid fever there is relative bradycardia. v Causative agent is gram-negative bacteria Salmonella typhi enter the host after consumption of contaminated food, milk or its product or unsafe water. v After ingestion organism reach to intestine mucosa cross the epithelium barrier and replicate in pyre’s patches area, mesenteric lymph nodes and spleen. v The infection through the lymphatic duct and thoracic duct reach the blood. Defensive mechanism when fails then signs and symptoms develop and involvement of Lymph nodes causes ulceration, haemorrhage and perforation of the small intestine. v The pyre, s patch ulceration occurs after the 3rd week, and infection can spread to the lung, gallbladder, kidneys and CNS. The bacteria has three types of antigens “O” called somatic antigen, “H antigen” or flagellar antigen other is “Vi” Antigen also called virulence Antigen. v INCUBATION PERIOD: -- varies from 3-21 days usually 10-17 days. Water born has longest, milk born has short and food born infection has the shortest incubation period because it has a large dose of micro-organism, water has the smallest dose. Ø RESERVOIR: - Man is the only reservoir .infected person may be case or carrier. The case may be mild, atypical or severe. The carrier is of 3 type’s convalescent, chronic and healthy carrier. v CONVALESCENT CARRIERS: - 50% pts discharge bacilli in stool for 3 weeks after onset of disease. v HEALTHY CARRIERS;-these are people who have no signs and symptoms of the disease but discharge bacilli. The bacillus resides in gallbladder, intestine, kidneys bones and cartilage and via stool and urine enters to new hosts. the bacilli can survive outside the human body for a different period of time .e.g. (In groundwater for 2-3 weeks, in faecal material for 12 months, In ice and snow for 3 months, In milk and its products for few days in flies for 34weeks). v Chronic or permanent carrier: the person who has not suffered from the disease for the last 12 months but discharge organisms in stool are called chronic carriers. 2% of typhoid patients become chronic carriers. v PREVENTION:-safe water supply and improved drainage diminish the incidence. v DIAGNOSIS:-WBC count shows relative leucopenia, blood culture, stool culture, Widal test and typhidote test is diagnostic. Ø Verification of diagnosis: - For diagnosis blood culture from the blood during the first week should be done; positive cultures occurs most likely during this period. Where culture fails, agglutination test (Widal test) is of great help. It is negative in the first week This should be done during the second week. There are three antigens, O (somatic), H (flagella), and VI (virulence). Ø Another test called TYPHIDOT it is serum ELISA test which shows us antibodies IgG, IgM. when IgM is positive it suggests acute typhoid when both are positive then it is acute but in middle stage of the disease. When IgG positive it shows relapse of re-infection of the previous disease. if both are –ive then it is not typhoid. Ø ISOLATION: - The case of enteric fever should be sufficiently segregated to prevent the infectious discharges reaching from others. The room should be fly-proof. Convalescents should be kept under supervision until repeated cultures of stools and urine are negative attendants should be inoculated and should observe strict personal hygiene. Ø DISINFECTION: - Excreta and vomit should be disinfected with 5% carbolic acid, 10% formalin or 3% bleaching powder. Urinals, bedpans should be scalded or washed with disinfectants. Sputum and vomits should be disinfected, fabrics burnt, boiled or sterilized with steam. Ø DETECTION OF CARRIER AND THEIR CONTROL; they can be detected by blood examination. No method is known for the prevention of faecal carriers. Removal of foci of infection in suitable cases is desirable to cure them. The carrier should be kept under official supervision. They should not be allowed to handle or cook food and should be instructed in personal hygiene. · Chloramphenicol is a drug of choice. The period of treatment is 5 to 7 days.